Red Hen Press is excited to announce the groundbreaking on our brand new permanent literary center in Pasadena, California. Join Los Angeles’ largest non-profit independent publisher for a groundbreaking ceremony and fundraiser at our new permanent site on September 10, 2017. There will be refreshments from local vendors, a live piano performance, and readings by many acclaimed Red Hen authors and poets. 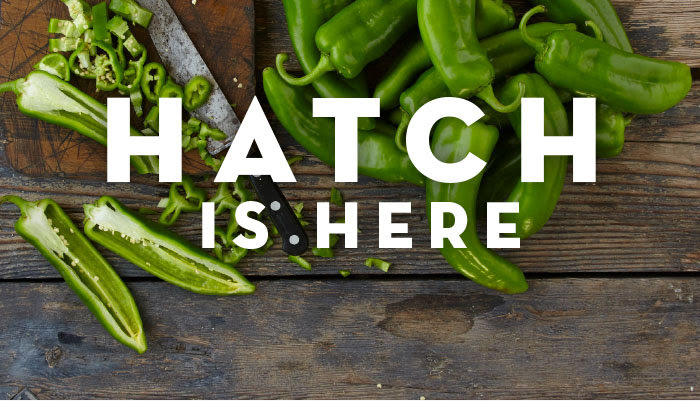 Join us as we launch the renovation of our new nest! Independent literary publisher of exceptional fiction, non-fiction, and poetry. 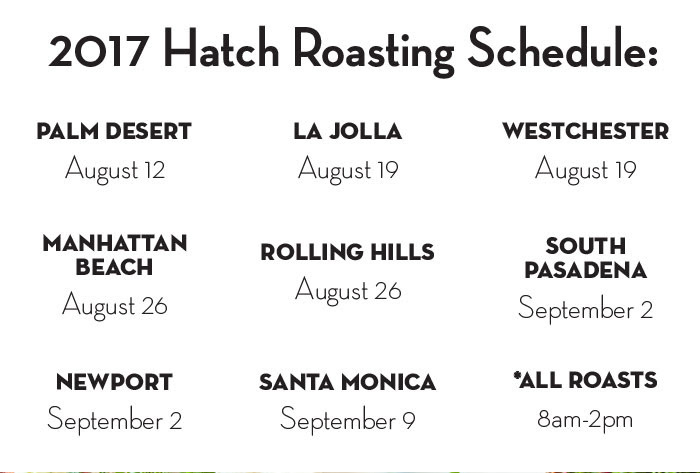 The biggest little press in LA. For Kate, see @Kate_Gale. Scheduled to re-open August 25, 2017, according to Yelp. If you have been to the other Nick’s locations you will agree that the quality of food is high. One favorite is their brunch menu. 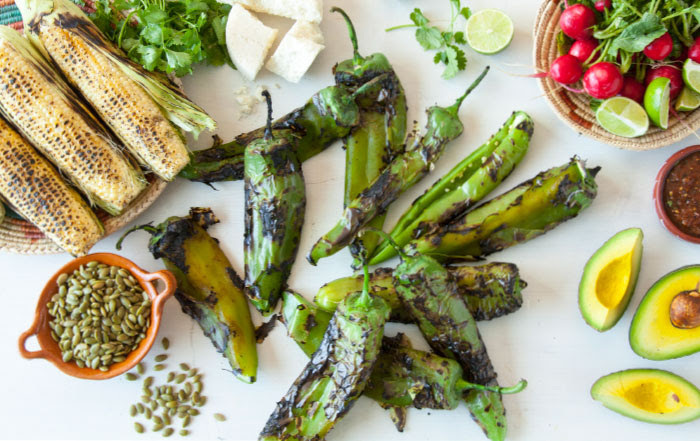 Classic American comfort food, crave-able bar snacks, plus unique cocktails & an extensive wine list. Nick’s Lake Avenue in Pasadena takes a slight detour from the coastal contemporary designs found at its six sister venues, the newest Nick’s features a stunning balcony, private wine room, and an airy garden room – all working harmoniously to combine the warmth and hospitality of a Nick’s with the finishes of marble, imported tile, wrought iron, and custom woodwork. fishwives Pasadena’s premier seafood house and oyster bar is opening soon. Located at 88 North Fair Oaks. The location previously occupied by several businesses. The area has a few new businesses moving into the area, which is welcomed. The soft opening is “soon”. The sign is up on the building and the anticipation of the opening is in the coming months. The Big Bear City Airport is pleased to welcome you to its 2017 Air Fair! The Air Fair will take place on Saturday August 26th from 9am to 3pm with a special Pancake Breakfast at 8am. This one-day only event is a longstanding tradition in the community. For more than thirty years, the airport has welcomed audiences of all ages to experience the thrill of aviation. Activities Include: Sky Divers – Helicopter and Bi-Plane Rides – Warbirds – Classic Cars – Kids Attractions – Gifts and Souvenirs – Food Vendors. The whole family will enjoy vintage planes, classic cars and skydiving exhibitions. Also adding to the fun will be community group exhibits, current aircraft displays and a wide array of souvenir and food vendors. There will be attractions that are just for kids. Best of all, IT’S FREE! A big thank you to all who have enjoyed this wonderful community event in the past, and a heartfelt welcome if you’re joining us for the first time. This day for aviation promises to be filled with fun, food, and fresh air! 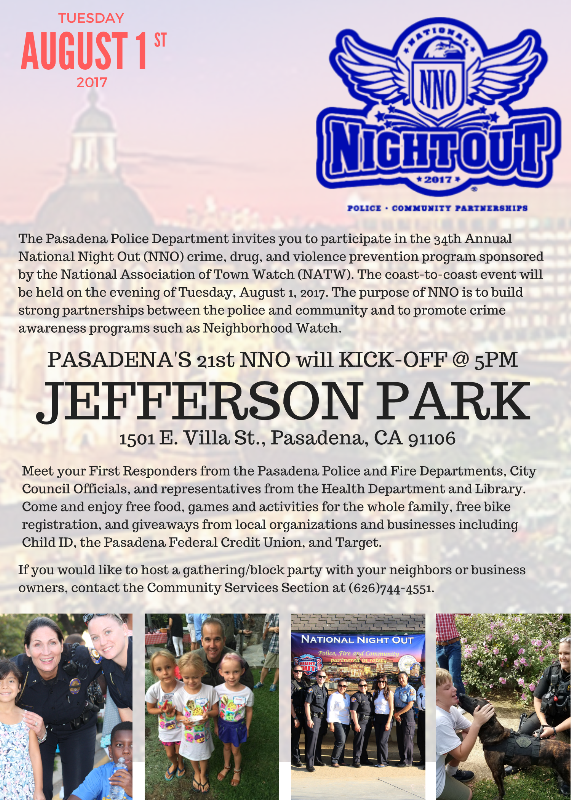 The Pasadena Police Department invites all members of the community to attend the National Night Out kick off event at Jefferson Park beginning at 5:00 pm on Tuesday, August 1st and encourages those living in close proximity to the listed neighborhood events to attend your local Neighborhood Watch or Association gathering and get to know your neighbors better. If you have further questions regarding this posting, please contact the Pasadena PD Community Services Section at (626)744-4551. REMINDER: The Pasadena PD is unable to see postings on Nextdoor. If you have a question or comment, please reply directly to the Police Department via telephone at (626)744-4241 for any and all Patrol operations and (626)744-4551 for Community Services programs.